Existe un Berlín que son muchos. Se trata de la ciudad famosa por sus barrios plenos de diversidad creativa a la hora de vivir, comprar, comer o simplemente mirar. La caída del Muro ha causado que algunos de estos barrios hayan renacido sorprendentemente, a veces mezclando lo mejor de los dos mundos antes divididos, y representen el espíritu libre de la capital alemana. 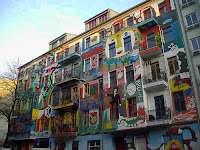 No hay visita a Berlín completa sin conocer el atractivo de estos barrios y su estilo de vida alternativo. las zonas más sorprendentes de la ciudad y sus sorprendentes tesoros: arte libre, tiendas, bares, restaurantes, edificios ocupados, cafés y mercados. Desde la más joven y rebelde Friedrichshain, antes en la zona comunista, a la vibrante mezcla de colores y población de Kreuzberg, pasando por los puntos más de moda en el centro, dentro de Mitte y Prenzlauer Berg. 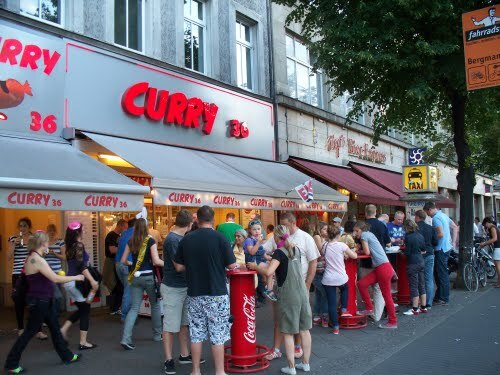 Visitaremos todos estos atractivos y comeremos la mejor Currywurst de la ciudad. There is no one Berlin, but many. This is the city today famous for its alternative neighbourhoods, blooming creative diversity in terms of living, eating, drinking, clothing or simply looking. The fall of the Berlin Wall meant for some neighbourhoods an opportunity to reborn by mixing the best of the two worlds before divided into Capitalism and Communism. Today these quarters represent the genuine free spirit of Berlin. Thus, there is no complete visit to the city without knowing the best of its alternative scene. ¡Vaya Berlin! shows you with this tour the most relevant sites of alternative Berlin: non commercial and street art, shops, cafes, restaurants, occupied buildings, markets and much more. From the youngest and most rebel district of Friedrichshain, before in the communist Berlin, to the colourful and enriching mix of nationalities at Kreuzberg, and the trendiest spots in the centre of the city included in Mitte and Prenzlauer Berg. 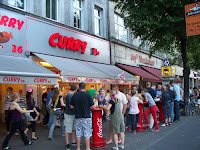 We will visit its most attractive sites, eat what today is considered the best Currywurst for berliners, and end up in one of the most famous streets for shopping and relaxing: Bergmanstrasse. * You would need to purchase one underground pass, zones AB.